pMCP-tag(m) Vector is a mammalian expression plasmid encoding MCP, an MCP-tag protein, which is expressed under control of the CMV promoter. This plasmid is intended for the cloning and transient expression of MCP-tag protein fusions in mammalian cells. 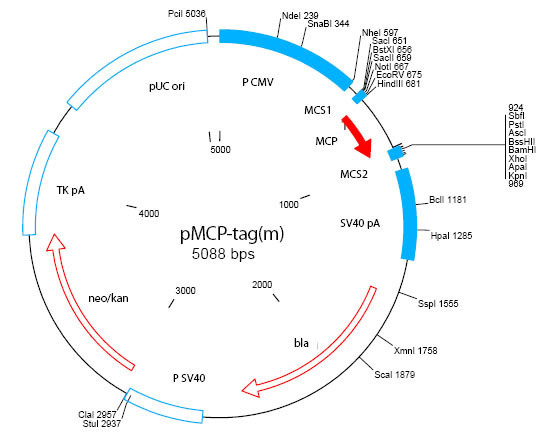 pMCP-tag(m) Vector contains two multiple cloning sites to allow cloning of the fusion partner as a fusion to the C-terminus of the MCP-tag and an appropriate signal peptide to the N-terminus of the MCP-tag. The MCP-tag is a small protein tag (8 kDa) based on the acyl carrier protein (ACP) containing two mutations (D36-T36 and D39-G39), for labeling cell membrane proteins. It allows the specific, covalent attachment of virtually any molecule to a protein of interest. MCP-tag substrates are derivatives of coenzyme A (CoA). In the labeling reaction, the substituted phosphopantetheine group of CoA is covalently attached to a conserved serine residue of the MCP-tag by SFP Synthase. Having no cysteines, the MCP-tag is particularly suited for specifically labeling cell-surface proteins, and should be useful for labeling secreted proteins with disulfide bridges such as antibodies. There are two steps to using this system: sub cloning and expression of the protein of interest as a MCP-tag fusion, and labeling of the fusion protein using SFP Synthase with the substrate of choice. The cloning and expression of MCP-tag protein fusions is described in this document. The labeling of fusion proteins with CoA substrates is described in the documentation supplied with CoA substrates and SFP Synthase. Cloning Region of pMCP-tag(m) Vector: Unique restriction sites in the regions flanking the MCP gene are displayed above the coding strand. This plasmidencodes the gene MCP which is a mutant carrierprotein. In the plasmid sequence, the MCP gene isencoded from bp 690 to 923. 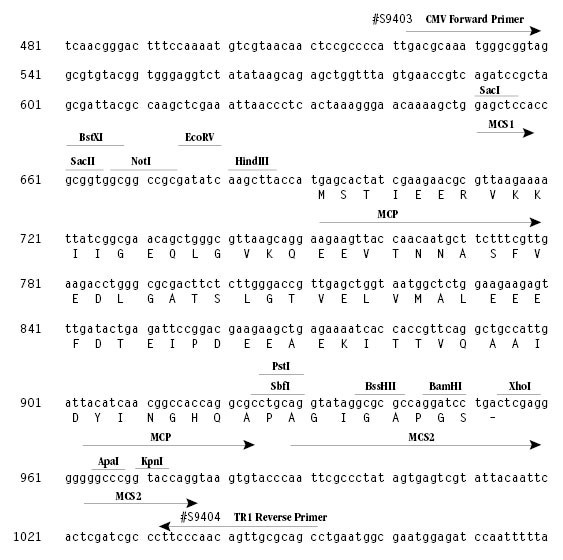 The MCP gene wascloned via HindIII and PstI including additionalflanking restriction sites. This plasmid is intended as a transient expressionvector for MCP-tag gene fusions in mammalian celllines. It is not recommended for the productionof stable cell lines. The plasmid contains theb-lactamase (Ampicillin resistance) gene formaintenance in bacteria. The plasmid also containsa CMV promoter and SV40 polyadenylation signalsfor correct mRNA processing. The gene of interestshould be cloned downstream of the MCP-tagcoding sequence, as a fusion to the C-terminusof the MCP-tag. An appropriate cell surface signalpeptide should be cloned upstream of the MCP-tagas an N-terminal fusion. A Kozak sequence islocated upstream of the MCP gene to increase thetranslation efficiency of the fusion protein. TheMCP-tag gene can be isolated from the plasmidusing PCR or direct cloning in order to subclone itinto a different vector system of choice. Storage: pMCP-tag(m) Vector is supplied in TE buffer (10 mM Tris-HCl, pH 8.0, 1 mM EDTA) at a concentration of 0.5 µg/µl. Plasmid solutions can be stored at 4°C for up to one week. For long-term storage -20°C is recommended. NEB 10-beta Competent E. coli (High Efficiency) (NEB #C3019) is recommended for propagating and subcloning this vector.